James Warner was born in 1941 in Ypsilanti, Michigan. He enlisted in the U.S. Navy on March 5, 1964, and was accepted into the Naval Aviation Cadet Program on April 21, 1965. 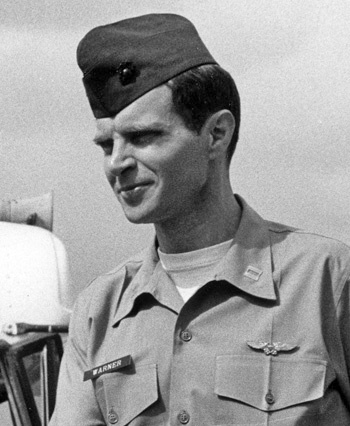 Warner was commissioned a 2nd Lt in the U.S. Marine Corps and awarded his Naval Flight Officer wings on January 22, 1966, and then completed Radar Intercept Officer school in April 1966. He was trained as an F-4 Phantom II RIO at VMFA-251 at MCAS Beaufort, South Carolina, from May 1966 to March 1967, when he was sent to Southeast Asia. Warner began flying combat missions with VMFA-323 out of Chu Lai AB in the Republic of Vietnam in March 1967 and he was forced to eject over North Vietnam and was taken as a Prisoner of War on Friday, October 13, 1967. After spending 1,979 days in captivity, he was released during Operation Homecoming on March 14, 1973. "Doc" Warner was hospitalized for his injuries at Great Lakes, Illinois, and he left the service on October 1, 1973. After leaving active duty, James went back to school and he received a B.A. in Economics and Philosophy from the University of Michigan in 1976, and a J.D. from the University of Michigan Law School in 1978. He served as a Domestic Policy Advisor to President Ronald Reagan and later served as a corporate attorney. While serving in the White House, James initiated the repeal of the national fifty-five mile per hour speed limit. While serving in Vietnam, Warner flew over 100 combat missions. 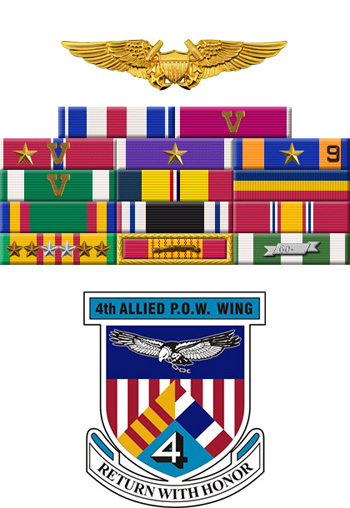 For conspicuous gallantry and intrepidity while interned as a Prisoner of War in Southeast Asia from October 1967 to June 1969. Despite maltreatment and severe torture, Captain Warner distinguished himself by his relentless rejection of any of his captors efforts to subjugate him or gain his cooperation. During the Spring of 1969 as the intensity of the enemy's cruelty increased, so also did his determination and spirit. By his steadfast refusal to cooperate with his captors, he provided his fellow prisoners with a personal example, giving them the strength to solidify and intensify their resistance to the maltreatment at the hands of the enemy. Risking his own personal safety in order to provide leadership for his fellow prisoners, Captain Warner exemplified courage and resolve which further attests to his loyalty, professionalism, and dedication to the United States. Through his high standard of devotion to duty, Captain Warner reflected great credit upon himself and upheld the highest traditions of the Marine Corps and the United States Naval Service.